Disclosure: This post is sponsored and underwritten by Gatlinburg Falls Resort. All opinions and text are my own. 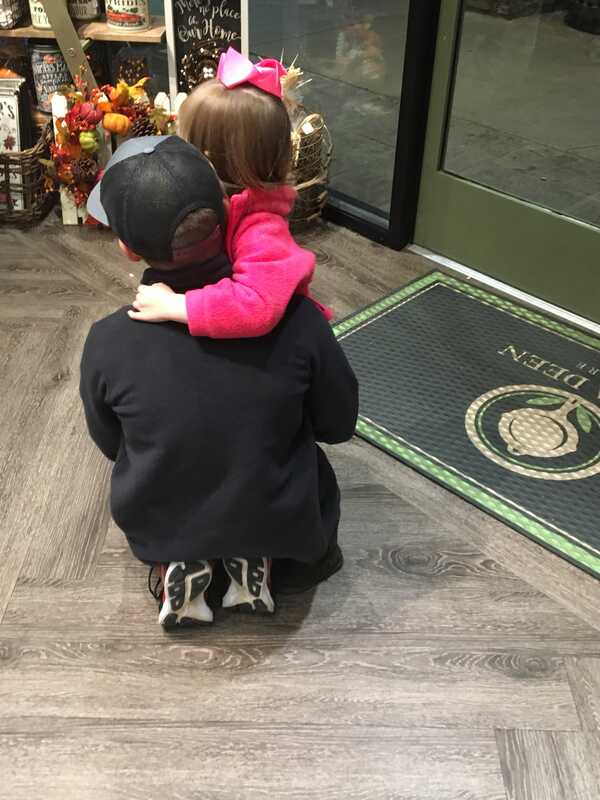 If you’ve read my blog for any length of time, you know how much our family values experiences and creating memories together instead of stuff. We quit throwing big “friend birthday parties” years ago and instead plan quick getaways to celebrate birthdays together. Also, for Christmas, we enjoy giving the kids a gift of an upcoming getaway to look forward to instead of tons of gifts that they will soon forget. Several years ago it hit me; we have 18 years with our kids. Eighteen years to create memories. Eighteen years to pour into their hearts. Eighteen years to strengthen relationships within our family. Eighteen years will fly by so very quickly. When the enormous reality of this sunk in, we started being very intentional about family getaways, and I started putting money back monthly to make room in our budget. Family getaways help us to stop the busyness of our lives for a short time and just focus on enjoying each other. When we go away together, there is no house to clean, projects to complete, schoolwork to finish, or rushing off to sports practices. 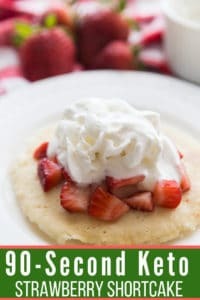 Instead, we enjoy meals together, shop, scream our heads off on rides at amusement parks, swim, make smores, cook breakfast together, watch movies, enjoy various attractions, museums, etc. In addition to all the fun activities, we stop and listen to each other talk, take time to truly belly laugh, enjoy each other’s company and rest to revive our tired bodies. 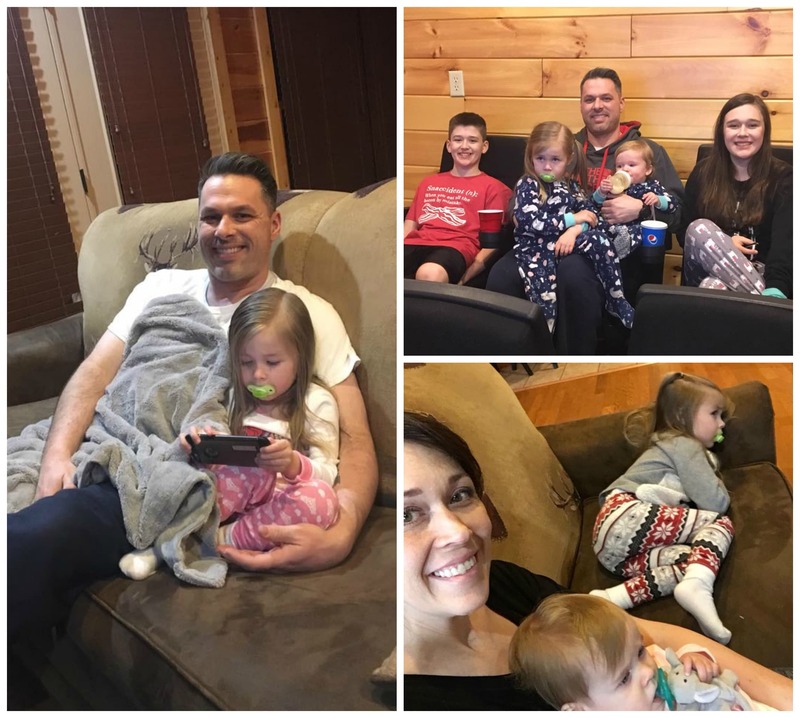 I thought I’d give you a glimpse into our last two family getaways so you can see why planning getaways together as a family are so important to us. 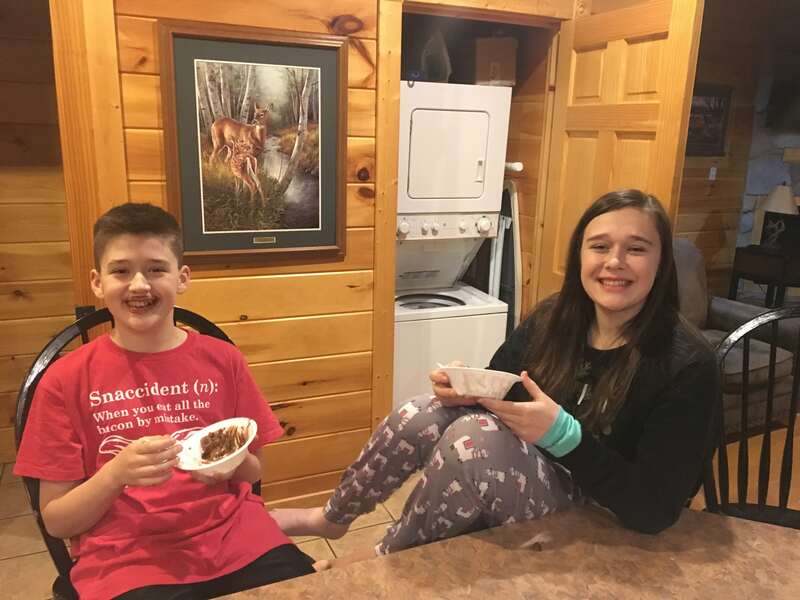 With a large family and kids of varying ages, 14, 11, 3, and 1, we prefer to stay in cabins or condos when we travel so that we aren’t on top of each other and it is generally cheaper than two hotel rooms. 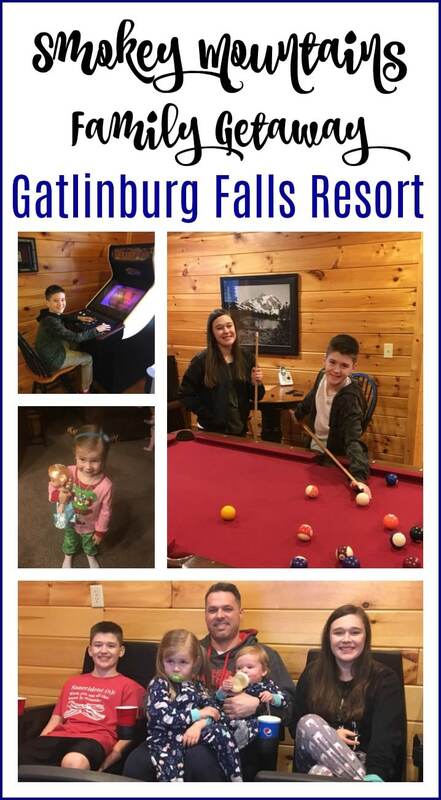 When Gatlinburg Falls Resorts offered to partner with me, I was over the moon as my kids always have enjoyed staying in cabins because of the fantastic entertainment options. Plus, we were already planning a getaway for two of our girls’ birthdays. Our sweet girls in the picture above turned 3 and 14 years old last November. Even though they are years apart, their relationship is unique. They adore each other so much. 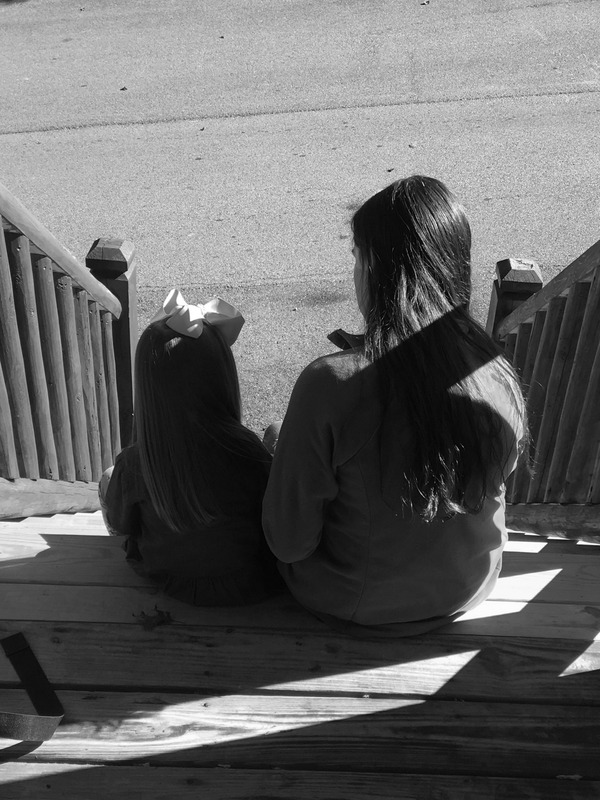 I snuck this precious picture of them on the front porch of our cabin as they were waiting for the rest of us to head out for dinner. These are the moments we don’t want to miss, and it is so easy in the hustle and bustle of life. Moments, when our kids are just loving and enjoying each other without the natural distractions of life, are so special. 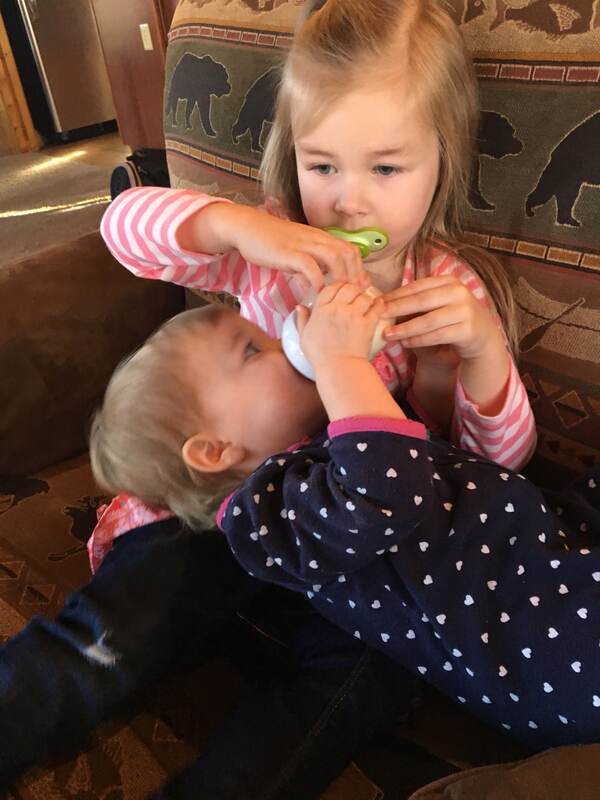 Even though there are many years between our big kids and littles, they are so sweet with each other. I never expected their relationships to be so close. My mom and brother came to town to celebrate the girls’ birthdays. It was so lovely to have somewhere that we could all go and hang out together instead of just spending time together at restaurants. 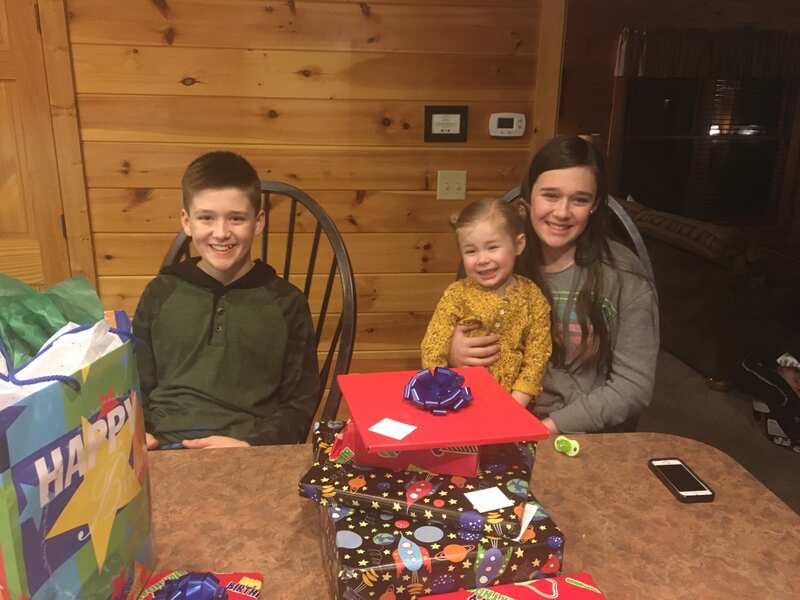 The cabin was the perfect place to gather together with my mom and brother to celebrate our 14 yr old and 3 yr olds birthday. They opened their presents, and we all enjoyed cake together. I can’t even believe that my first baby is 14. We only have four years left until she is 18. 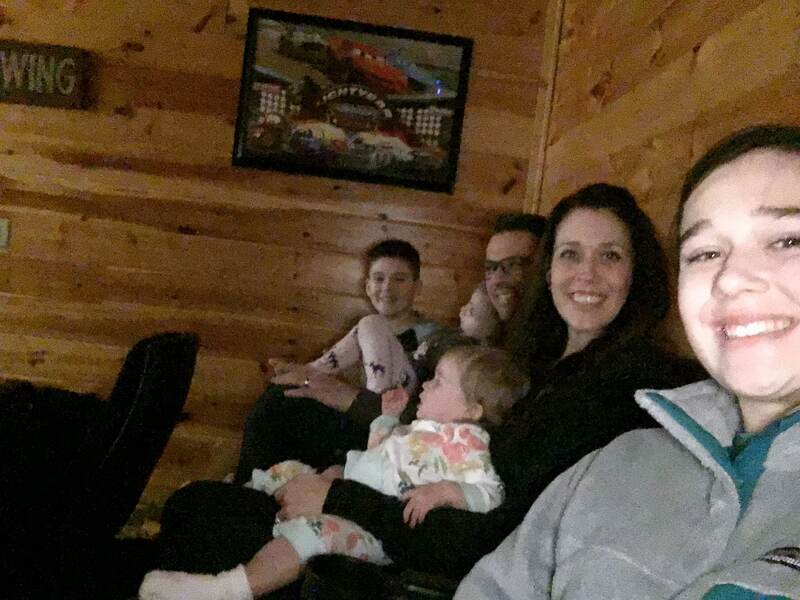 Because time has flown so quickly, I am so thankful that we decided to be intentional with our family time together. I know that we only get one chance in their childhoods to create memories and make deposits into their hearts. These are moments that we will treasure forever. Do you see that photo bomber on the left side of the picture? There isn’t much that is more precious than the imagination of a 3-year-old with her favorite character’s jewelry. 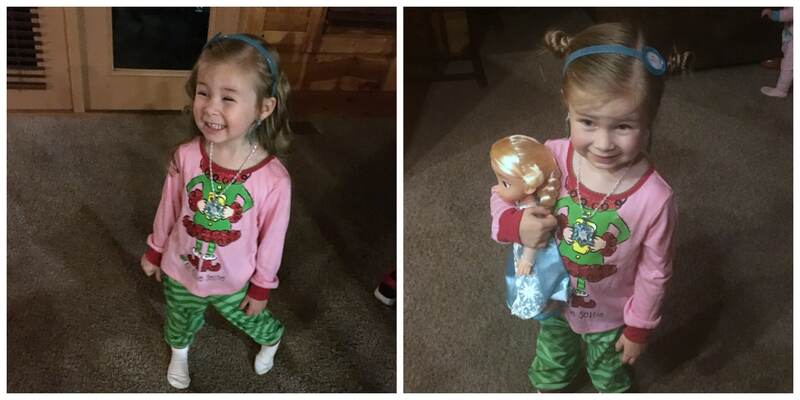 She pranced around like Princess Elsa the rest of the evening after opening her birthday presents. 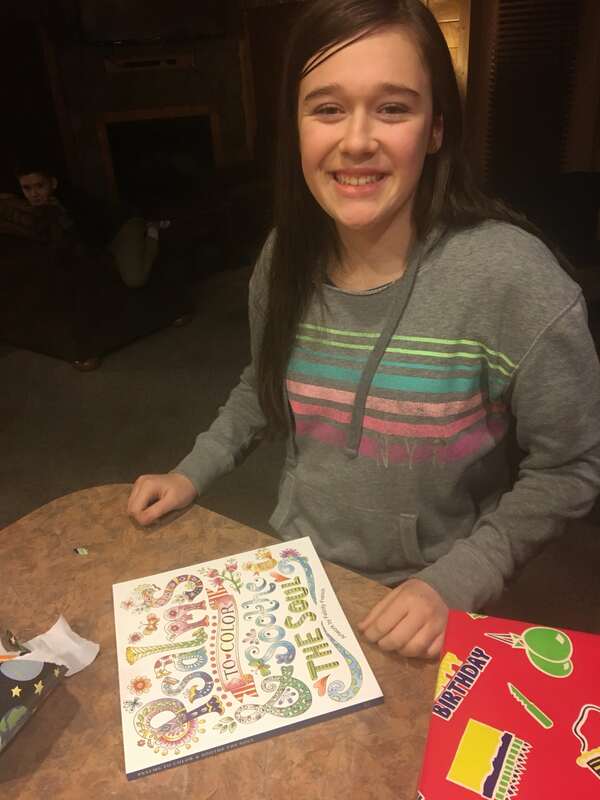 One thing I love about staying in a cabin while we are in Gatlinburg is that my big kids stay entertained and we aren’t always on the go looking for something to do. Every morning, evening, and afternoon while the little girls were either napping or asleep for the night our big kids still had a blast. They had pool tournaments and enjoyed hanging out with each other, which also saved us money in the long run. 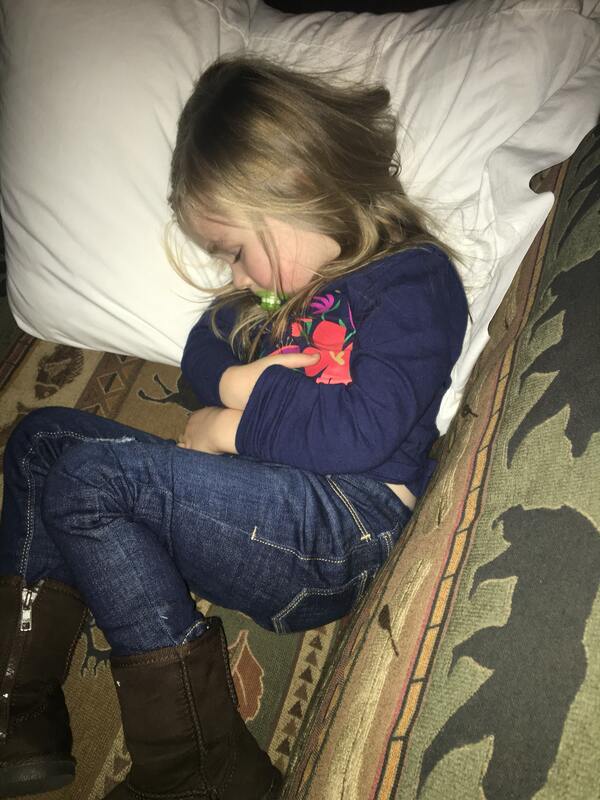 In fact, we had so much fun each day this sweet girl crashed on the couch. Instead of us having to tiptoe around her while she slept, there was plenty of room for the rest of us since the cabin had three floors. On the back porch, there is a hot tub, which was a fabulous way to relax in at the end of the day. We waited for the little girls to go to bed first so I could enjoy time with the big kids. 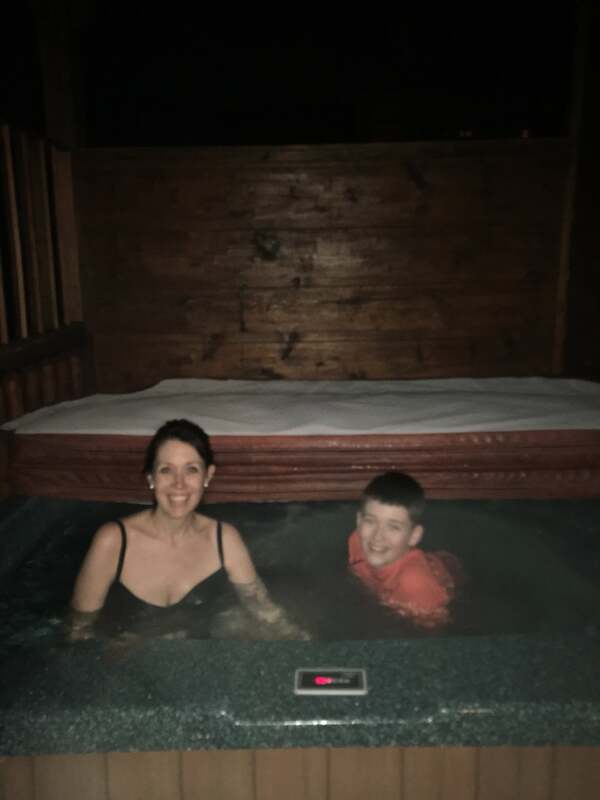 For some reason, my hubby almost passes out every single time he gets in a hot tub, so we left him inside to listen for the girls. The 3 yr old got a new Paw Patrol Book for her birthday that we read together before bed. Staying in a cabin gives a home away from home feeling. It’s so nice that we can all spread out and enjoy each other without being on top of each other. I get major claustrophobic if we stay in a hotel with so many of us and the luggage. It just feels like there is clutter everywhere, which drives me crazy. Even the little girls got to have special time together. Having a relaxing vacation does us all so much good because it causes us to slow down and just savor each moment together without continually running from one place to another. 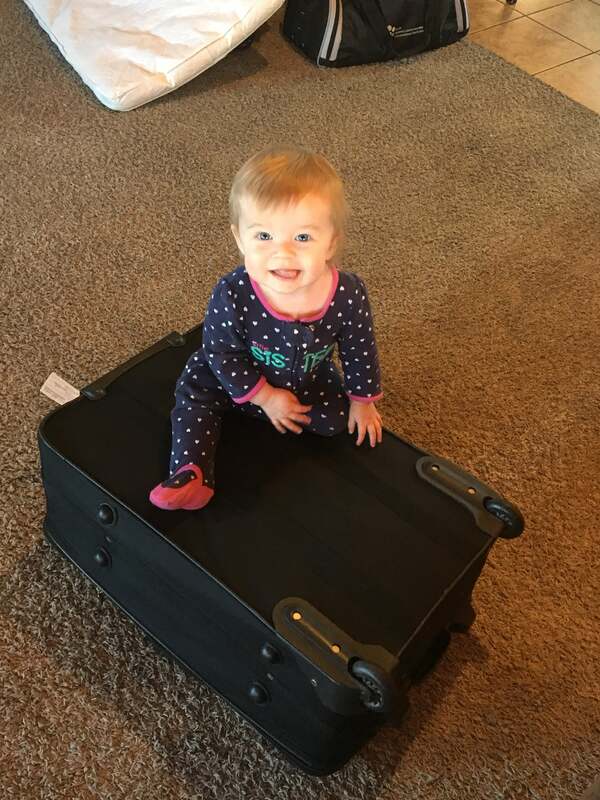 I’m pretty sure she wasn’t ready to leave since she was blocking access to the suitcase. Oh, how I love spending time with my family. This time away to celebrate two of our girls’ birthdays was so needed. 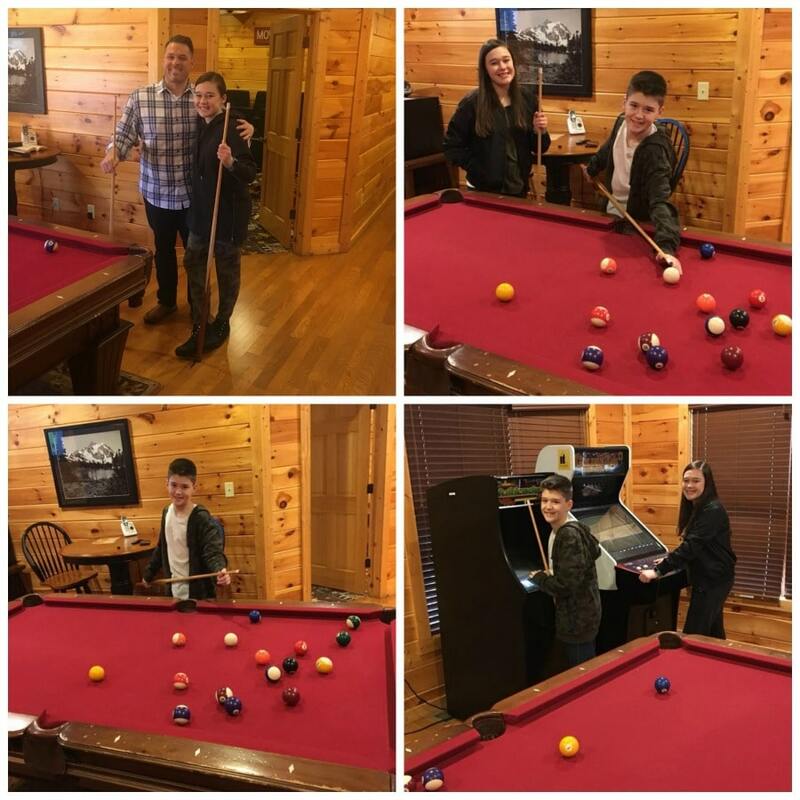 We made wonderful memories enjoying our favorite restaurants, freezing at Dollywood, shopping, and just hanging out with each other at the cabin. For this stay, we stayed in the Bear Cave cabin at Gatlinburg Falls Resort. It is a 3 BR, 3 full baths, 2 half bath, cabin with a media room, hot tub, and game room. You can find all the details here along with pictures of each room. Here we are two months later on our way back to Gatlinburg Falls Resort for a second getaway after Christmas before school started back. 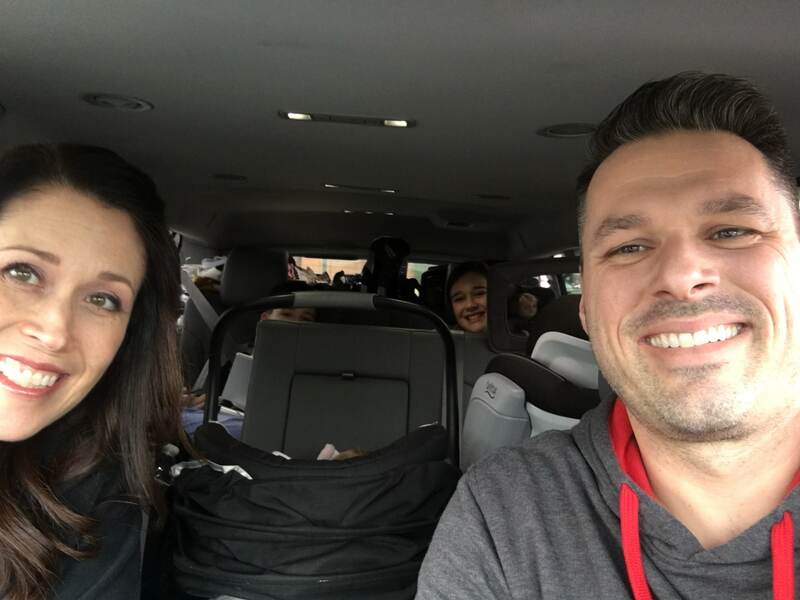 We were so excited to load up and head out again to Gatlinburg, TN after having to postpone our trip the week before when our 3-year-old was diagnosed with the flu. After being home for a week without leaving the house, we couldn’t wait to start our vacation. This time we stayed in a 4BR, 4 baths, and 2 half baths cabin, Time Well Wasted. It also had a game room, media room, and outdoor hot tub. I’m not sure what prompted me, but the first morning of our visit I made a video tour of our cabin. I am so glad that I did because that evening both of the little girls woke up with fevers and the rest of our trip wasn’t very exciting. Here you can go room by room and see what I point out that was important to me as a mom for my family. 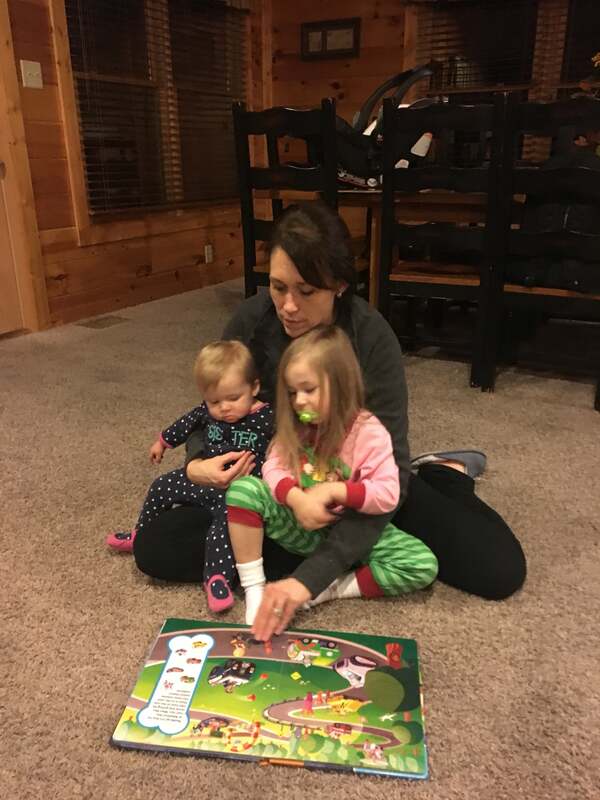 Because the little girls were not feeling well, we spent lots of time this trip in our cabin. I am so thankful that we weren’t stuck staring at each other in a hotel room. Instead, we stayed in and let the little girls rest while we enjoyed time with our big kids. We watched a couple of movies together in the media room. It was so wonderful just to let the baby down and not have to worry about distracting others in a movie theatre. She walked circles around us and ate snacks, which meant that mommy got to enjoy the movie with everyone else. The game room was such a hit with the big kids. If we weren’t watching a movie together, you could find our oldest two and often my hubby downstairs shooting pool, playing air hockey, or competing against each other playing video games. 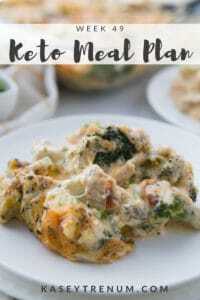 This allowed my hubby and I to have some downtime and the little girls to nap without the big kids being bored to death. Here is a big family vacation budget tip I’m going to add for free. Instead of going out for ice cream and paying upwards of $5 a person, buy ice cream at the grocery store and enjoy it back in your cabin. 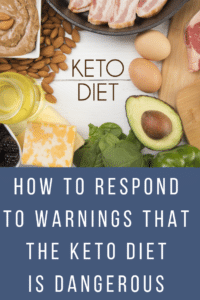 We started doing this because of my daughter’s severe peanut and tree nut allergies but quickly realized how much cheaper it was. 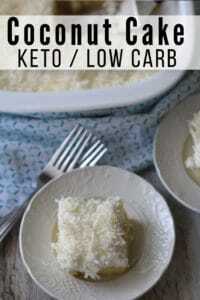 In fact, each person can pick out their favorite ice cream and fixings, and you will still save money. Our kids always enjoy ice cream parties on vacation because we very rarely eat ice cream at home. You know you can’t let ice cream go to waste. 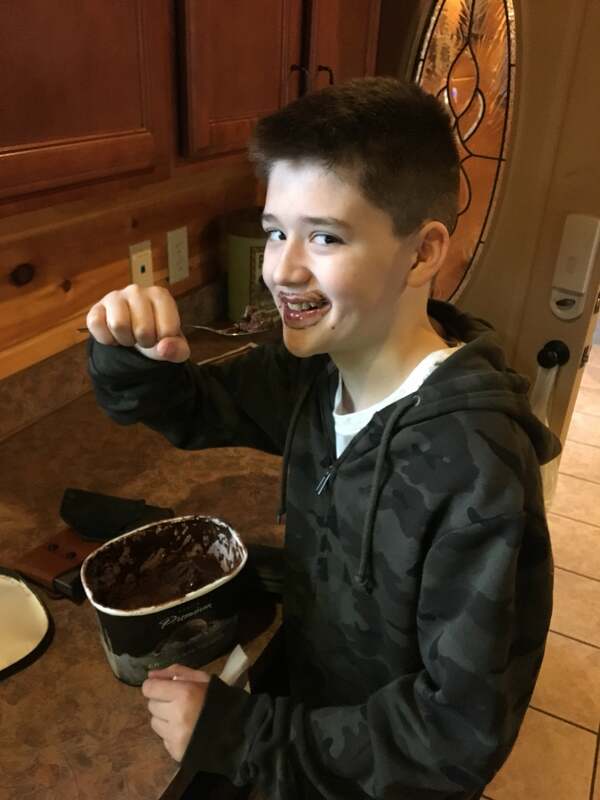 Here we are with the car packed and ready to walk out the door to head home, but my little buddy decided to clear out the rest of the ice cream. Isn’t it every kid’s dream to eat ice cream straight out of the package with a spoon? This is what vacation fun is made of. This is how we spent a large part of our vacation, with our little girls snuggled up with us. Even though we couldn’t go out and do some of the things we wanted to do, we had such a beautiful time together. We did take the big kids to ride go-carts and one of the Alpine slides while my hubby and I took turns sitting in the car with the little girls during their naps. 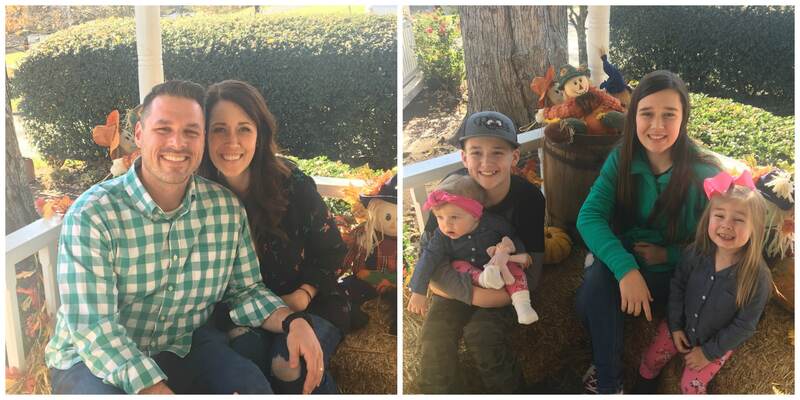 I am so thankful for my family and love setting aside time at the beginning of the year after the busyness of the holidays just to enjoy each other. 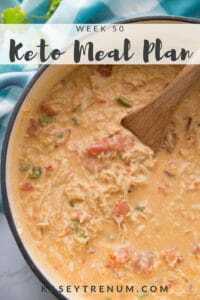 My hubby and I have started to sit down with our calendars and plan family time because if we don’t then before we know it six months has passed and we are all just doing life. I encourage you to be purposeful to make memories and create family traditions together. Make sure to check out Gatlinburg Falls Resort in Gatlinburg, TN. Our family had a blast and enjoyed our stay so much. 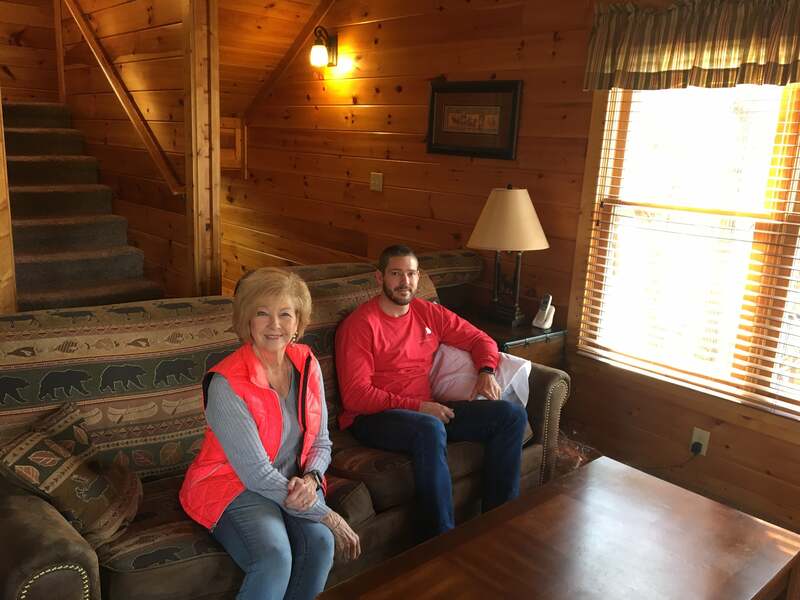 With over 400 rental cabins near Gatlinburg, Pigeon Forge, Wears Valley and Sevierville, Cabins of the Smoky Mountains is the largest cabin rental company in the Smokies. We loved our stay and plan to go back soon. You can check out their special offers here.